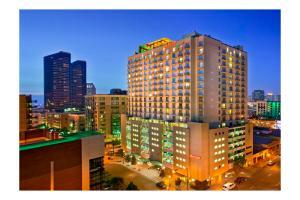 The San Diego Marriott Gaslamp Quarter perfectly situates you to enjoy the exhilarating pace of the city. The hotel is just two blocks from the San Diego Convention Center, within walking distance to shopping at Horton Plaza or Seaport Village, and is convenient to the beach, Coronado Island and the San Diego Zoo. The 306 luxurious rooms and suites afford breathtaking views thoughtful amenities. Located only 3 miles from the San Diego International Airport.